Then a friend served me a properly-made Mai Tai—no goofy mug, no garnish, just an icy rum drink on a hot Minnesota day. Tiki became interesting. Without all the trappings, a well-made Tiki drink provides a tall, balanced glass of hokum-free refreshment, with the added culinary intrigue of complex aromas and flavors. The Zombie, originally called Zombie Punch, and arguably the drink that put Tiki concepts—including hokum—on the map. A properly made Zombie is a complex, tall drink of fruit juices, spices and rums, a carefully balanced blend of flavors and aromas anchored by a heavy payload of Puerto Rican and Demerara rums. “Properly made”—there’s the rub. The Zombie is more a concept than a recipe, and as such it is a mishmash of uninspiring inventions. Donn Beach, the Zombie’s inventor (and the “Don” of Don the Beachcomber fame) is primarily to blame. Beach laid claim to mixing the Zombie close on the heels of Repeal, somewhere around 1934. But while he was a great self-promoter, Beach was also a very secretive businessman. Fearful that his employees would sell his secrets, he wrote his recipes in code, and premixed ingredients so even barmen wouldn’t have any idea what they were serving. And of course, neither would we. Fortunately, Berry cares about Tiki drinks. It is his research that has saved the original Zombie from oblivion. 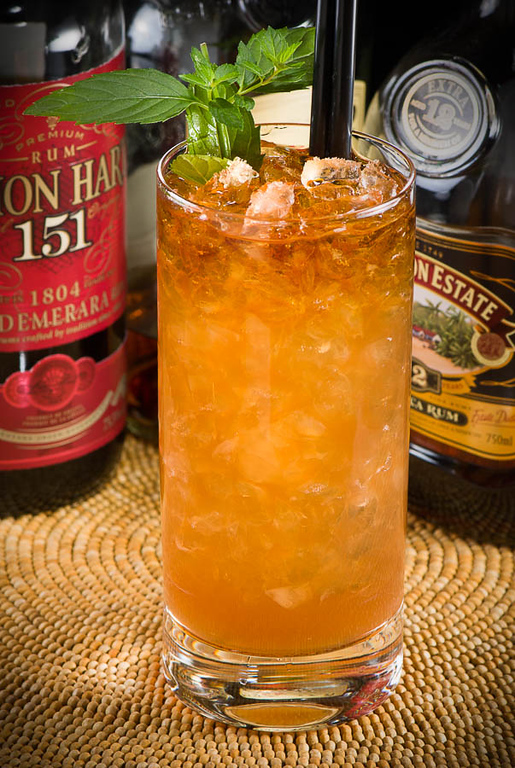 The original 1934 Zombie Punch represents an evolution of the punches of the 18th century. The original punches were basically citrus, spirits, sugar and water (or occasionally tea), and often nutmeg as a garnish; the Tiki concept expands on that, with additional tropical fruits, more complex spices and sweeteners, and careful selection and blending of multiple spirits. Punch on steriods, you might say. The Zombie was not the first “Tiki” styled drink, but it is certainly the one that made the idea famous. It was apparently the most famous, and most popular, of the Tiki punches for ten years, until the advent of Trader Vic’s Mai Tai in 1944. Add all ingredients to blender and blend at high speed for no more than 5 seconds. Pour into chimney glass. (Alternatively, shake all ingredients with ice, then strain into a tall glass filled with crushed ice.) Top up the glass as needed with ice cubes. Garnish with a mint sprig. *Don’s Mix: 2 parts fresh white grapefruit juice to one part cinnamon syrup. If you don’t have access to the Lemon Hart 151, I recommend that you stick with the demerara style, rather than substitute some other 151-proof rum. Lemon Hart makes an 80-proof demerara, and the El Dorado 12 works nicely, too. The lower-proof rums don’t have the richness of the 151, but they do work in this drink. Which brings us to the blender. I recommend that you have a very light hand when it comes to blending the Zombie—my blender turned my first attempt into a slushy in no time. (Believe me, you don’t want a slushy—hard to drink, drastically reduced flavor, and no aroma at all.) Five “pulses” might be a better way to describe what’s needed, and it’s really more like three pulses on my machine. Fortunately, I’m blessed with a nice ice crusher, and I much prefer the ice from that device; I shake the drink with cube ice as usual, and strain into a tall glass of separately crushed ice. What does the Zombie taste like? There is a reason that Beach provides such a long list of ingredients, and in such varied proportions. Many of the elements are used the way you’d use herbs and spices in cooking; each contributes to the whole, and it is easy to use too much or too little. In this case, the cinnamon provided by the wee bit of “Don’s Mix” is all about aroma. 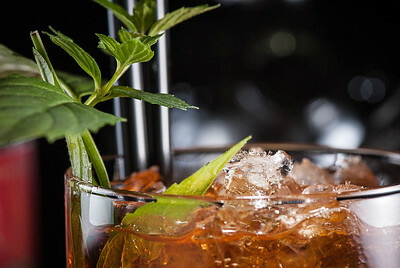 As you lift this drink, there is a breeze of the mint garnish and cinnamon. The sip is initially about the rum, brightened by the citrus, particularly the grapefruit. Finally, the earthier flavors appear, the clove of the falernum, the herbs of the absinthe, and the faint, funky smokiness of the demerara rum. “Making Zombie Punch” at cold-glass.com : All text and photos Copyright © 2012 Douglas M. Ford. All rights reserved. Good Zombie post. I haven’t got into Tiki yet. Much as I’d like to, that rum shopping list gets a bit long. Thanks, and I know what you mean about these ingredient lists. These drinks can seem both fussy and expensive. It’s taken me a long time to get around to writing up Zombie Punch for exactly those reasons. The drink is delicious; making it is annoying. Tiki was actually my gateway into cocktails… the barrier to entry was a bit high. I owned a dozen different types of rum before I bought my first bottle of bourbon. You are, as my mother used to say, “a glutton for punishment,” DJ. It’s definitely a pantry full of rum—and a basket full of fruit—to build a tiki repertoire. That’s quite a starting point. My hat is off to you. Love the post. I appreciate learning about new ingredients and the history behind the cocktails. I, however, do like the Tiki culture and still miss the old Kon-Tiki Restaurant in Cleveland, although when it was in operation, I was too young to drink. What do you remember most about the Kon-Tiki? Oh the little foot bridge on the way into the restaurant, the net with glass floats. My friends and I always ordered the shrimp salad and the punch that was served (without rum) in a hollowed out pineapple (with fruit and an umbrella). For dessert it was always coconut pineapple ice cream. I have never found any that tasted as good. By the way: what rums do you and your friends prefer in the Zombie? For Zombies and many other tiki drinks we use the lemon hart 151, Appleton 12 year old and El Dorado gold (we are big fans of the Eldorado white and gold). We also play around with Barbancourt 8 yr old and Flor de Cana gold in many recipes. I know what you mean about the Puerto Rican rums—there doesn’t seem to be much “there” there. El Dorado would be a fun substitution; I would think it would go nicely with the LH151. For me, if I had to simplify the most salient feature of what makes any Zombie a Zombie, it’s the cinnamon-grapefruit combo. I agree—”Don’s Mix” is the memorable flavor profile of the Zombie. And lots of rum. Another great drink we intend to offer at the new GR bar. I’ve been playing with a lot of variations on the Zombie at home with some coworkers, to find our favorite, and it’s almost a bit disappointing to find that there’s just nothing quite as good as the original. I say disappointing because this is not a bar-friendly drink, though I suppose it’s not terribly home-friendly either (the pride of my kitchen is my 43-bottle rum collection, including a Flor de Caña Centenario 21 Commemorative Edition, unopened). Death and Company has a cheater bottle they keep on hand called “Zombie Mix,” which is just a mixture of 2 tsp absinthe (I use Vieux Carre Superior), 1 oz plus 4 tsp grenadine (I make my own using Jeffrey Morgenthaler’s recipe) and 8 oz Velvet Falernum. I’ve made the Zombie using that mix, and for whatever reason, it has a marked increase in astringency and alcohol burn over simply adding the ingredients in seperately. I’ve tried using Gosling’s 151 in place of Hamilton 151 (the Lemon Hart replacement), since Gosling’s is readily available in Michigan. I’ve substituted Cruzan Single Barrel for the Bacardi 8, substituted Newfoundland Famous Screech for Appleton 12…for whatever reason, to my palate, there is just no substitution in this drink that isn’t inferior to the precise recipe you’ve listed here (identical of course to the one unearthed by Mr. Berry). I am considering swapping that Bacardi for some Caña Brava, but soon I’m going to be forced to admit that all my experimentation is just an excuse to drink more zombies…. Anyway, sorry for rambling here. I hope my new habit of leaving long, rambling posts on your blog posts isn’t too much of a nuisance. I’ve seen neither the Gosling’s 151 nor the Hamilton 151 in my market, those are both new to me. I always struggle with 151 substitutions, trying to figure out if the flavor profile or the proof is the important issue. I really like the Demerara flavor profile, so the disappearance of Lemon Hart’s 151 is very unfortunate. For now, I’m using the Plantation 146, but it’s a very different rum. Hamilton sounds like a very likely LH substitute, and I look forward to finding a bottle. But the most interesting thing is that Zombie pre-mix. It’s hard to imagine what goes wrong there. It’s not like there’s citrus going bad or something. Very peculiar. There are plenty of mysteries in the cocktail world. And my hat is off to you and your enviable rum collection. Thanks! Yeah, I can’t explain easily why it’s worse with the cheater mix, but I’ve done enough blind tastings and it’s undeniable. It could honestly be as simple as the proportions being off; I just took the Death and Co. formula as I found it, and it’s very possible that they started with a drink of different proportions. Still, for me, the experimenting can get expensive when using grenadine made from fresh, juiced pomegranates, real absinthe, and Velvet Falernum, which I have to specially order. Using 8 ounces of the stuff was a blow, especially after deciding that it was for an inferior drink. But we live and learn. The Death and Co. version is still drinkable, and cutting back on the Hamilton cures the problem, at a loss of some of the richness of the original. I was wondering if it were the proportions making the difference. Thanks for the update. Doug, first I’d like to give you a hat’s off thank you for writing such a standup blog… I just whipped up my first zombie; and all I can say is “wow, that’s one helluva tall drink!” I’ve been learning the ropes on Mai Tai’s and Navy Grogs for quite some time; and finally got my chops up on making the requisite zombie syrups: Don’s Mix, grenadine, et al. While this drink comes out of the gate bucking and charging like an untamed bronco, I find that my sweet spot is halfway through when the dilution lets the cinnamon, anise and bitters come out from behind the rums. I look forward to getting to know the zombie better with a bit of experimentation & experience. Mixing notes: everything is scratch-made, from the falernum to the cinnamon syrup (use/find the Ceylon variety at your local supermercado – it’s labeled “canela”) and grenadine. I used LH151, Appleton 12 & sub’d Plantation 5 for the gold – I shied away from the Bacardi Gold I had on hand because I felt it was outclassed by the Lemon Hart & Appleton… maybe the next one will get some El Dorado 12 instead! That’s one thing I’m currently learning about: the subtle yet distinct differences on trying this rum or that rum in the same recipe. It’s a steep learning curve; but one that’s oh so enjoyable! Cheers and keep up the great work. Thanks for the supportive comments, it’s always good to know Cold Glass is helpful. As far as the dilution observation goes, I kind of got some immediate respect for the LH151 out of that… I had tried an “oops pour” float with my mai tai just to experiment with it; and it is no joke! It reminds me of the phrase “now you’re cooking with gas!” I also tried sub’ing a 1/2oz of LH151 for the 1oz of dark rum in a navy grog; and that was outstanding! I might try that more often, even if to get more mileage from the bottle… Who knows, I’m just having loads of fun with this tiki drink adventure. Thanks again for you’re wonderful blog Doug! Let’s hear it for tiki. Have fun.